Notes by John Powell. Magnificat will perform to of Charpentier's divertissements for the Dauphin, Les Plaisirs de Versailles and La Couronne de Fleurs on the weekend of October 3-5, 2008. From late 1679 until mid-1683, Charpentier composed music for the establishment of the eldest son of Louis XIV and Queen Marie-Thérèse. 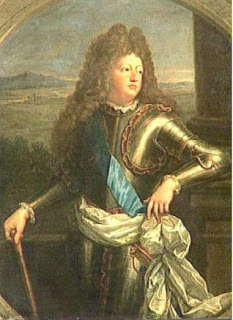 Also named Louis, he was popularly known as the Grand Dauphin and referred-to at court as “Monseigneur”. Monseigneur had been given a musical establishment of his own a few months prior to his wedding (on 7 March 1680) to Maria Anna of Bavaria, and for several years he remained loyal to Charpentier and his musicians—who would provide music throughout the 1680s. “The Dauphin’s Music” consisted of three vocalists: Magdaleine Pièche, a high soprano (haut-dessus); Marguerite Pièche, a soprano (dessus); and Antoine Frison, a bass (basse). They were accompanied by two treble instruments—usually flutes, played by Antoine and Pierre Pièche—and basso continuo. Charpentier had known the singers from his collaborations with Molière in the early 1670s, when the Pièche sisters (then ages 7 and 9) had danced in, and Monsieur Frison had sung in, Le Malade imaginaire (1673). During this fête, an “opera” was performed every Saturday (Mercure, Jan. 1683). Les Plaisirs de Versailles and La Couronne des Fleurs were most probably performed on these occasions. In an annotated list of the manuscripts that Charpentier bequeathed to him, the composer’s nephew Jacques Edouard claimed that Les Plaisirs de Versailles was a “piece for the King’s apartments”—for those evening entertainments in the royal palace at Versailles hosted by the King (and referred to generally as “the apartments”). Indeed, on his manuscript title page Charpetier includes the rubric: “la scène est dans les app[artements] ”. These two works are examples of the operatic divertissement: a short entertainment that is sung throughout in the manner of an opera, but has only one act and lasts a mere half-hour. As common in the divertissements of French opera, the main characters of Les Plaisirs de Versailles are all allegorical—La Musique, La Conversation, Le Jeu, a “Choeur des Plaisirs”—and one mythological figure, Momus, the god of festivities. The singing of La Musique is interrupted by La Conversation, who cannot stop prattling. They argue at length and with increasing heat: which of them is more essential to pleasure…expecially the King’s pleasure? Fearful that they both will leave the château of Versailles in anger, the Chorus of Pleasures calls upon Comus to mediate. He offeres them chocolate, fine wine, exquisite pastries. No use. He then pleads for help from Le Jeu, who is equally unsuccessful, for La Musique and La Conversation continue their bickering. Finally, however, they are reconciled, and the Chorus of Pleasures sigh with relief: Music, Conversation, “our flutes and our voices” can continue to help distract the great King from his military pursuits. The most striking thing about this lightweight mini-opera, besides its witty and sparkling text, is the sharpness with which Charpentier portrays each character musically. La Musique is languid, tender, sensuous. La Conversation has to admit that she is a “sociable siren”. La Conversation is a nonstop chatterbox, and something of an idiot: she cannot tell a minuet from a courante. La Musique confesses, however, that she is a “babillarde divinité”. Comus, a bass, is a gourmand of small sensibility and Falstaffian bluster. Le Jeu (perhaps played by Charpentier himself) is a wheedling card-sharp. La Couronne de Fleurs was most probably also performed at Versailles for such an occasion. Names of singers from the musical establishment of the king’s cousin, Marie de Lorraine, Duchess of Guise, known as “Mademoiselle de Guise”—which she shared with her cousin/aunt Isabelle d’Orléans, Duchess of Alençon, known as “Madame de Guise”—appear in the margins of Charpentier’s manuscript. We will recall that Madame de Guise had arranged for musical events to coincide with her winter residence at Versailles; given the flatteries paid to the King in La Couronne des fleurs, it seems likely that Louis XIV was present for the performances. The text is a free adaptation of the original 1673 Prologue to Molière’s final comedy-ballet, Le Malade imaginaire (1673). In fact, the unknown librettist (perhaps Charpentier himself?) retained only the skeletal outlines of the Prologue. Flora, goddess of spring, calls upon the flowers to repopulate the desolate winter fields, and summons the shepherds and shepherdesses to return. “Louis has banished from them the dire sounds that the cries of the dying and the clash of arms had once allowed to reign there.” She then calls for a contest to see who can best sing of the valiant deeds of Louis. Four brave shepherds (Amaranthe, Forestan, Hyacinte, and Mirtil) try their best, and compare Louis’s warlike prowess to that of a devastating spring torrent, to a bolt of lightning, to the great deeds of ancient Greece, and lament that future generations will scarcely believe the least of his exploits…as they will have nothing with which to compare. Pan then appears to call a halt to the contest, and Flora renders her decision: although they all lack the strength and ability to do justice in song to Louis’s immortal glory, it was enough that they attempted it. So she divides the flowers among the four contestants. In a final ensemble, they wish that just as Louis is the master of the world, may he become the master of time and live a hundred years. Du chocolat! Dieu nous en garde!